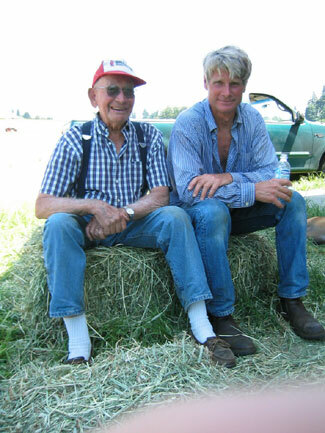 Omega Farm is a small 25 acre family farm nestled along the Columbia River near the community of Ridgefield Washington. We grow Timothy hay for horse lovers and the finest Organic Bartlett Pears you will ever taste. Shown here with the red hat is our good friend and neighbor Wally Harris. Wally planted our pear orchard around 60 years ago. It is said pear trees are planted for the next generation's benefit and for the past 28 years we have been grateful for both his foresight and friendship. Wally planted the classic full size (ᠧotta climb the ladderඡriety on a generous 18 by 20 foot tree spacing. This wide spacing does not allow for high tonnage but the trade off is it does provide for maximum sun exposure and air circulation contributing to our pears extra full sweetness. We have the best of all worlds for growing excellent fruit: wonderful soil, mild temperatures and sufficient rainfall. Also we are isolated from many diseases that plague east side growers. What's with the windmill on the logo? Do you really have a windmill? Yes indeed we do. Back when Jimmy Carter was President we put up an Enertech wind generator on a 75 foot tower right in the center of our orchard. It puts out a maximum of 1500 watts AC. The 360 degree view from the top of the tower is unbelievable. Looking South you can see the high-rises in Portland, to the West the town of St. Helens, Oregon and the Cascade Mountain Range to the East.